Lebanese Prime Minister Fouad Siniora says Israel is "opening the gates of hell and madness" on his country. In a BBC interview, he urged Hezbollah to release two captured Israeli soldiers but said Israel's response to the crisis had been disproportionate. The UN is evacuating all non-essential staff, joining tens of thousands of foreigners fleeing the crisis. Fresh Israeli strikes have killed 11 Lebanese soldiers, while Hezbollah rockets killed an Israeli in Nahariya. Israel launched its assault and blockade last Wednesday after Hezbollah fighters captured two of its soldiers. About 230 Lebanese people have been killed since then - the vast majority of them civilians, but including about 30 soldiers. The number of Hezbollah fighters killed is not known. Twenty-five Israelis have died - 13 civilians and 12 members of the military. Israeli Prime Minister Ehud Olmert has reiterated his government's demands for the captured soldiers to be freed without condition and for Hezbollah to be disarmed. Israeli Foreign Minister Tzipi Livni held talks on Tuesday with a UN team trying to negotiate a ceasefire, but said the soldiers' release and the deployment of the Lebanese army in the south would have to precede a ceasefire. Her comments came as tens of thousands more foreigners were set to leave Lebanon by land, sea, and air. A British warship docked in Beirut at the start of a mission to transport up to 12,000 Britons and a further 10,000 people with dual British-Lebanese nationality to Cyprus. The US, Canada and other governments were also organising evacuations by land, air or sea. As Israel launched fresh cross-border attacks on Tuesday, six bodies were pulled from the rubble of a home in the Lebanese border village of Aitaroun, and another family was killed in the coastal city of Tyre. The 11 Lebanese soldiers were killed at a barracks east of Beirut. 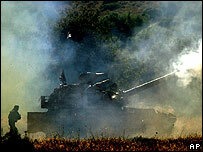 The Lebanese army has been ordered not to respond to the Israeli attacks. But Lebanese soldiers have now died in several strikes, including one on the port of Abdeh on Monday in which nine died. In Tuesday's attacks by Hezbollah, rockets hit the northern city of Haifa, as well as Safed, Acre, Kiryat Shemona, and Gush Halav region near Safed, Israeli officials told AP news agency. "I was near the bomb shelter, there was a humongous boom, and I saw it was two metres (yards) next to my house, really two metres," Eli Dayari, a resident in Nahariya, told Israel's Channel 10 television. "People are panicking and the house was on fire, really big flames, the firefighters are here." Israeli military officials say more than 700 Hezbollah rockets have landed in Israel since the crisis began.